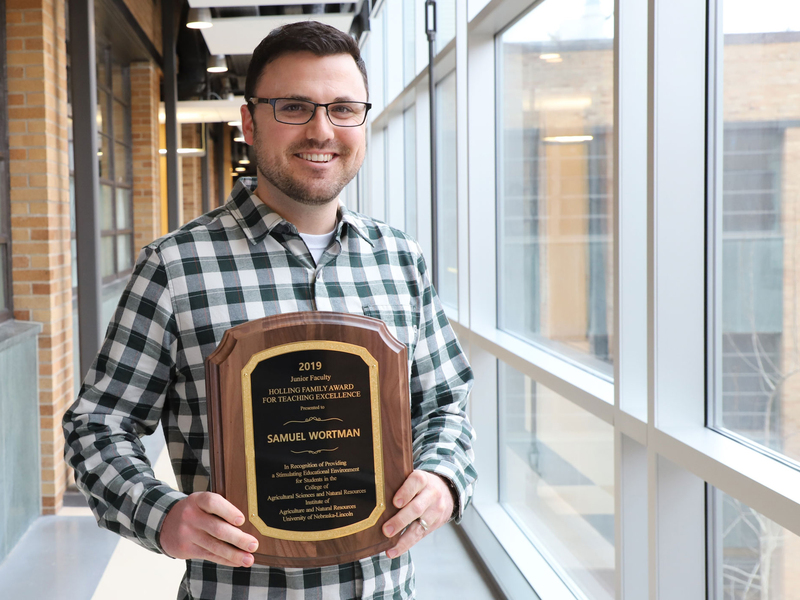 Sam Wortman, assistant professor and environmental horticulturist in the Department of Agronomy and Horticulture at the University of Nebraska–Lincoln, received a Junior Faculty Teaching Excellence Award on Tuesday, March 12. The award is one of ten Holling Family Awards for Teaching Excellence given to Institute of Agriculture and Natural Resources senior faculty, junior faculty and teaching assistants each year. All three award categories honor outstanding teaching with an emphasis on imaginative and creative teaching efforts in carrying out IANR educational programs. The Junior Faculty Teaching Excellence Award recognizes individuals who have been employed in faculty positions with IANR or the Nebraska College of Technical Agriculture for six years or less. Wortman received his masters and doctorate degrees in agronomy from Nebraska and returned to the department in 2016 with a teaching and research appointment. Prior to returning to Nebraska, he was an assistant professor in the Department of Crop Sciences at the University of Illinois with teaching and research efforts focused on Urban Food Production. Recently, he has developed two new courses, Plants, Landscapes, and the Environment (AGRO/HORT/TLMT 100) and Innovations for Agriculture (AGRI/AGRO/HORT/TLMT/EAEP 375), for both online and resident students. He also teaches Plant Propagation (HORT 221). “Sam is open to new ideas and is willing to share his course content, seek advice and use the expertise of others. In his online HORT 100 course, Sam used technology and the field to have his students take a virtual tour of the Backyard Farmer Garden,” said Kim Todd, associate professor and Extension horticulture specialist. Wortman has worked with the horticulture faculty to revise the HORT major, which included developing new student learning outcomes, revised options and a new option called “Customized Studies” that allows students to work with their advisor to co-create a program of study that is uniquely tailored to their career interests and aspirations. “Sam projects his energy and enthusiasm into all aspects of his teaching and interactions with faculty. His leadership on curriculum revision for the horticulture/landscape options and the department has been positive and inclusive,” Todd said. Inspired by the Nebraska Extension Testing Ag Performance Solutions Program at the West Central Research and Extension Center, Wortman experimented with a new learning activity described as the “Sustainable Lettuce Competition” in the inaugural offering of the course Plants, Landscapes and the Environment. This competition was designed as an interactive and collaborative “virtual” class experiment to enhance on-line learning. The goal was to give the 72 undergraduate students in a predominantly online audience, the opportunity to make evidence-based management decisions for a greenhouse lettuce crop. The students were divided into teams and tasked with choosing all management decisions for their lettuce crop – media, fertilizer type, fertilizer rate, irrigation rate, biological inoculants and marketing strategy – and backing their decisions with scientific evidence. Wortman and his teaching assistants would then implement each team’s decisions and provided students with weekly video and photo updates of the lettuce production process, growth differences among teams and any unexpected plant responses. Students were tasked with achieving the best balance of productivity, input use efficiency and profitability or sustainability. Upon harvest, students received harvest weights for every plant and each team’s crops. The data was then used to calculate individual sustainability metrics and draw conclusions about the most and least important management factors. “Students experienced a real, complex system that they evaluated to meet learning objectives,” Todd said. Ultimately one team was crowned the 2018 Sustainable Lettuce Champion and received custom plant pots created at Innovation Studio. “Framing this systems experiment as a competition with prizes and public recognition intentionally increased student engagement and buy-in,” said Roch Gaussoin, agronomy and horticulture professor and faculty mentor. According to Gaussion, teaching the scientific method is a consistent challenge in on-line classes without a hands-on lab. The Sustainable Lettuce Competition engaged students in the processes of developing hypotheses and experimental treatments and aggregating, analyzing, and interpreting data they helped to create. “Sam embodies the qualities of an ideal faculty member through his authentic engagement and commitment to serving students demonstrated in his first two plus years at UNL,” Gauission said. In addition to teaching, Wortman’s research focus is on environmental horticulture exploring the effects of local conditions and management on horticultural crops and the environment. His goal is to develop novel management tactics for local, urban and organic specialty crop farmers that increase yield and reduce labor without jeopardizing environmental quality.